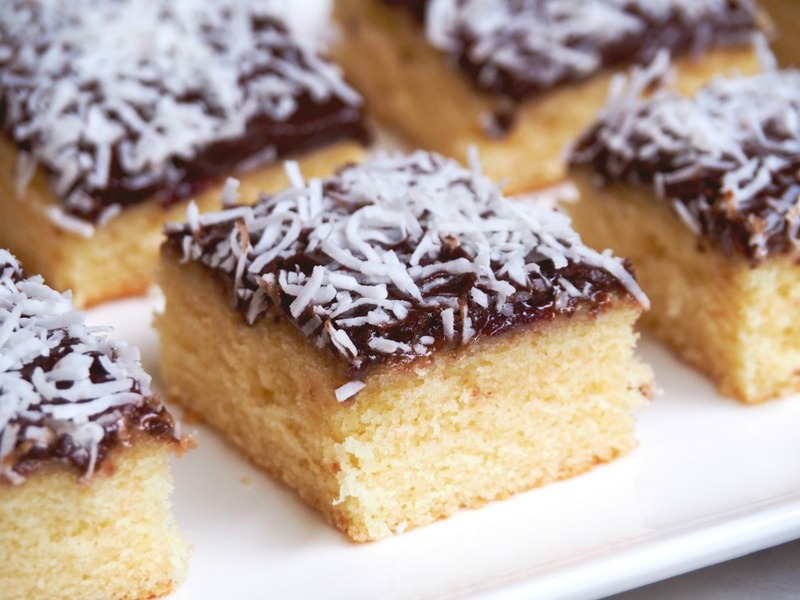 Making lamingtons has been on my list of 101 Things to Do in 1001 Days for quite some time. 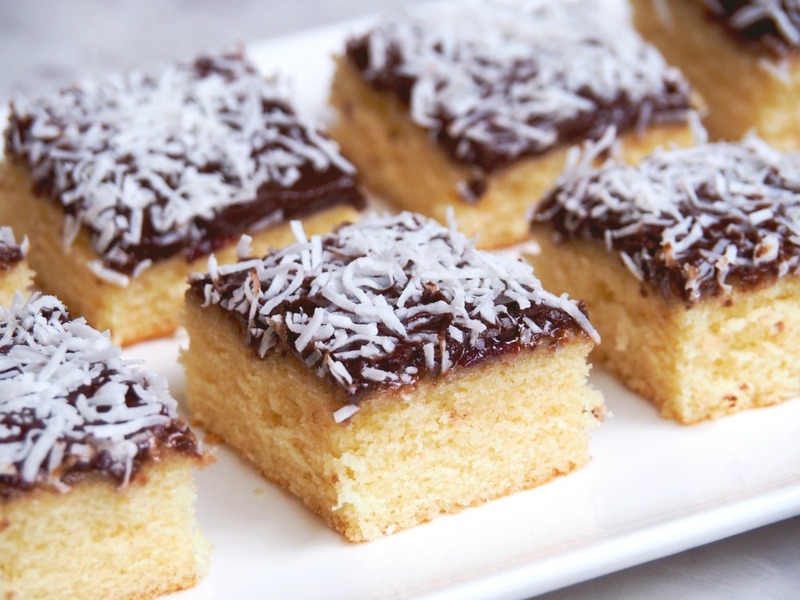 I’ve put this delicious spongy, chocolatey, coconut goodness in the too hard basket because to be quite honest, I just couldn’t face the mess. 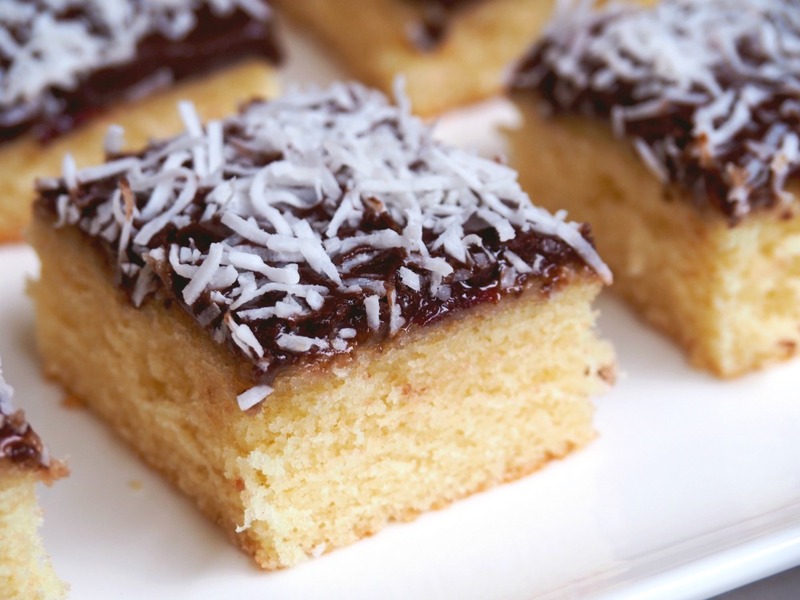 The truth is, I’m a messy worker at the best of times and I think conventional lamingtons would result in Kitchen Coconut Armageddon. 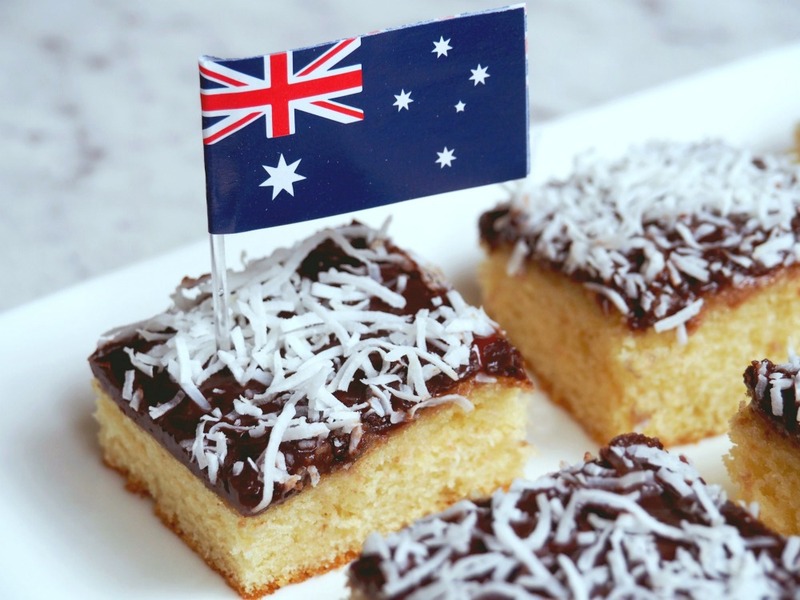 Even though we got Australian citizenship in 2015, it’s only now I’ve made a lamington that I feel “really” Australian, especially now that I’ve added other Australian delicacies like Anzac Biscuits, Anzac Blondies and Pavlova to my baking repetoire. This slice is so easy, the hardest thing is waiting for the icing to set! Making it in a tray means more serves and less mess – one thing is for sure, this slice will feed a crowd and please a crowd. Is there a bake you’d like to master? 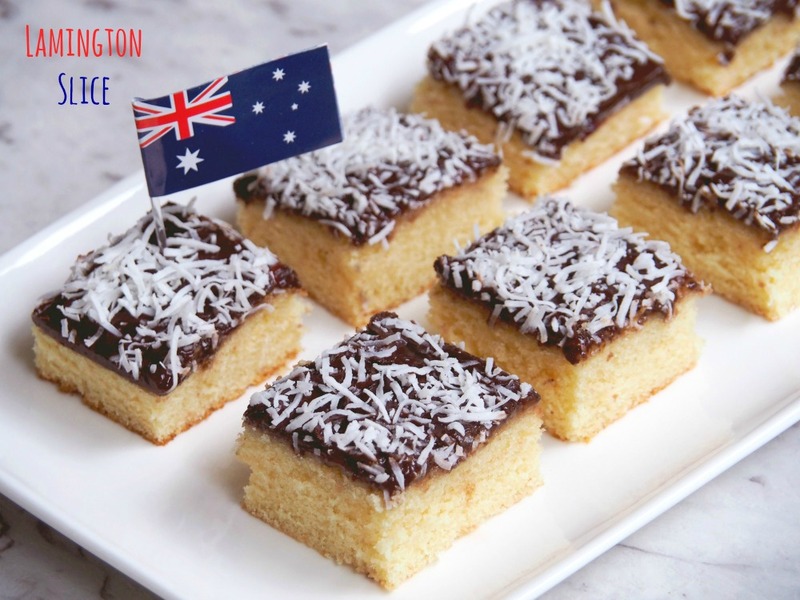 Have you ever made a lamington? Preheat oven to 180 C/160C fan-forced. 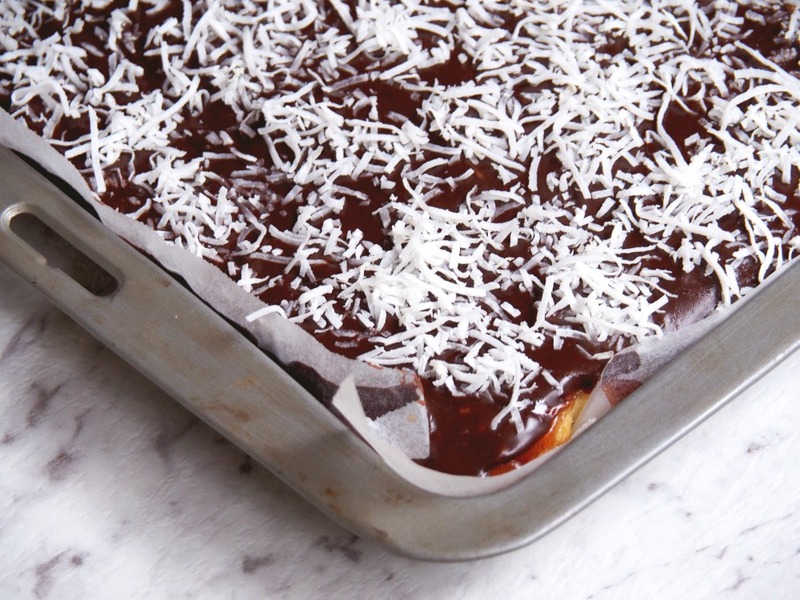 Grease a 33.5cm x 23.5cm lamington pan and line the base and long sides with baking paper. Extend the paper 5cm over sides to make handles. Sift flour, baking powder, bicarb and salt together into a bowl and set aside. Pour the buttermilk into a measuring jug and stir in the vanilla and set aside. Cream the butter and sugar in a large bowl with an electric mixer at medium speed until light and fluffy. Reduce the speed and add the eggs one at a time, beating for about 30 seconds between additions. Add alternating amounts of the flour mixture and then the vanilla-buttermilk, blending well after each addition. This should take about 3-5 minutes. Pour into the prepared tin and bake for about 20 minutes until the cake is beginning to shrink away from the sides and a cake tester or skewer comes out clean. Allow to cool for 10 minutes. Place the jam in a heatproof jug. Microwave on high for 2 minutes until the jam is bubbling and runny and then carefully spread the jam over the sponge and smooth it out. Allow to stand for 10 minutes or until jam sets. Sift the icing sugar and cocoa into a heatproof bowl. Add the boiling water and stir until smooth – you want it to be runny enough to slide off a spoon – and then immediately spread it over the slice taking care not to disturb the jam. Sprinkle the coconut over the top and then place into the fridge for a minimum of 2 hours to set. When the icing has set, cut into squares. Add flour, baking powder, bicarb and salt to TM bowl and combine for 5 seconds on speed 5. Set aside. Chop butter for 5 seconds on speed 7. Insert butterfly. Add sugar and mix for 1 minute on speed 4.Scrape down lid and sides of bowl. Remove butterfly and the MC from the lid. Add eggs one at a time through the hole in the lid, with the blades running on speed 4, mixing for 5-10 seconds between each addition.Scrape down lid and sides of bowl. Add all the other ingredients and mix for 5 seconds on speed 4. Scrape down lid and sides of bowl and mix for a further 10 seconds on speed 4.